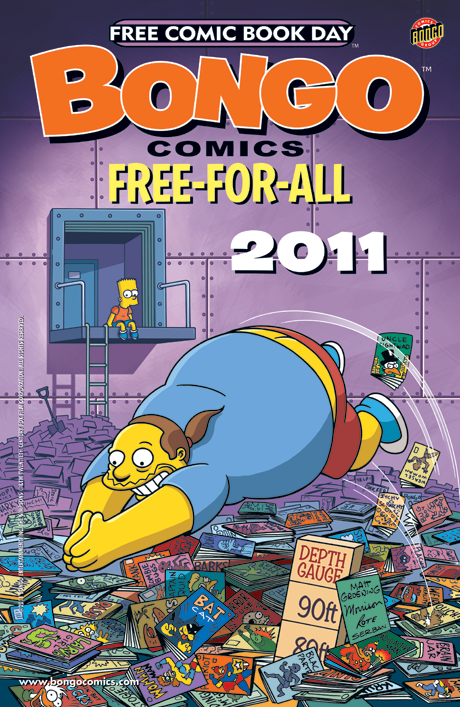 Bongo Comics joins with other comic publishers and the finest retailers throughout North America and around the world to participate in Free Comic Book Day on Saturday, May 7. Take the plunge into a treasure trove of Bongo Comics with our brand-new, exclusive, one day, one-shot collection of stories featuring Bart Simpson and Milhouse Van Houten’s efforts to play a new video game (courtesy of Evan Dorkin and Sarah Dyer); Ralph Wiggum’s unpredictable run-in with the school bullies (by Jesse Leon McCann, James Lloyd, and Andrew Pepoy); and a Springfield Elementary field trip to the circus (as chronicled by Sergio Aragonés). Several of Bongo’s artists and writers will be appearing around the country on Saturday, including: Bill Morrison and Jesse McCann (signing at Comics Unlimited in Westminster, CA from 11 AM to 1 PM), Andrew Pepoy (signing at Third Coast Comics in Chicago, IL from 1-3 PM), Phil Ortiz (signing at The Comic Bug in Manhattan Beach, CA from 12-4 PM), and Evan Dorkin (signing at Comic Book Jones in Staten Island, NY). To find a comic retailer participating in this year’s event, check out the Free Comic Book Day locator site freecomicbookday.com.